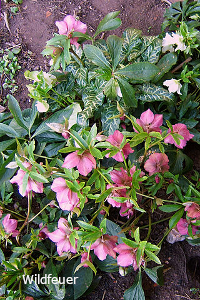 Helleborus ×hybridus is a group of evergreen clump-forming perennial cultivars that are 50-70 cm tall and spread to 70-90 cm. The glossy, deep green foliage can be quite variable in color and shape, even within the same hybrid. They have tough, almost woody stems with leaves and terminal inflorescence on the same stem. Flowers come as single or double forms ranging from pure white through red, pink, yellow, green or cream, to purple-black with perhaps speckled, spotted and mottled on the inside of the flower. Seeds occur in pods and the plants are long-lived, and are deer- and rabbit-resistant, being poisonous if ingested. May cause dermatitis to sensitive individuals. For maximum freshness, please keep seed refrigerated in its original packaging until it is time to plant. Sow seed in containers in a cold frame as soon as you receive your seed order. Grow on in any good garden soil rich in organic matter in full sun or dappled shade. May take 2-4 years to grow to flowering size.